You are here: Home / Latest News / News & Media / Would you like to retire by 40? Many younger Australians are joining the Financial Independence, Retire Early (FIRE) movement. Is it right for you? When you’re starting out in the workforce and building your career, retirement can seem like a long way away. 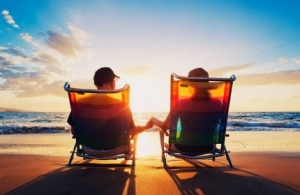 And with the age at which you can access your super and age pension creeping up—not to mention the increasing cost of living—you might be steeling yourself for a longer working life. The stats don’t lie—Australians are staying in the workforce for longer and any thoughts of retiring early are becoming a distant dream for many of us1. But there’s a growing movement of younger Australians who believe that by following the right set of rules, it’s possible to achieve early retirement. Popularised by US-based blogger Peter Adeney, better known as Mr Money Mustache2, the Financial Independence, Retire Early movement looks more closely at what makes us happy. FIRE is all about following an extremely frugal lifestyle with the aim of retiring as early as your 40s…or even your 30s! At the core of the FIRE philosophy is changing your attitude towards spending and saving. But FIRE is more than just following a budget. It’s a whole-of-life movement that inspires fervent belief in its followers. adjusting their lifestyle to live a simpler life. Like any movement, FIRE inspires some committed followers and some of the lifestyle advice can seem a little extreme—churning credit cards to access freebies, living in a truck to avoid rent and even sifting through bins outside restaurants for free food. Now, if the thought of going without your daily latte…not to mention movie outings, fine dining and regular holidays…sounds like a living nightmare, then perhaps FIRE isn’t for you. But if this sounds too much like hard work, don’t worry. You don’t have to be quite so committed. You could consider making some simple changes to your daily habits to reduce your spending and boost your savings. Make a list of where you could cut back to reduce your waste. Cycle all or part of the way to work and save on transport costs. Shop around for the best deal on utilities like gas, electricity and water. Entertain at home—a monthly Netflix subscription costs less than a single movie ticket. Once you’ve ramped up your savings, you could think about being a little more savvy with your money. Bring your super together into one account to avoid paying more than one set of fees. Look at ways to save and invest your money to increase your potential returns. Consider investing in property…but watch out for aggressive gearing, especially if interest rates change. You may not retire quite as early as the more committed FIRE followers. But you may just put yourself in the box seat to retire on your own terms. And along the way, you might find yourself reappraising your attitude towards money and happiness. https://www.tdls.com.au/wp-content/uploads/2016/07/retirement.jpg 195 300 The Webmaster https://www.tdls.com.au/wp-content/uploads/2016/10/tls-logo-1.png The Webmaster2018-11-12 22:06:592018-11-14 03:31:11Would you like to retire by 40?